Sure plenty of players have stepped up in the absence of the MLB’s best all-around hitter (such as Ryan Ludwick and Brandon Phillips), but two players have been getting the job done all year. Johnny Cueto has not only proven himself to be a formidable number one starter, but he has also proven to be arguably the best pitcher in the National League. Cueto currently is tied for the NL lead with 15 wins and ranks third in ERA (2.45). Make sure to note that the two pitchers with better ERA’s than Cueto in the present have 10 wins and 9 wins respectively (Vogelsong and Zimmermann) Then there is the Cuban Missile. Outside of one short-lived rough patch just before the All-Star break, Aroldis Chapman has been the most dominant pitcher in baseball. Chapman has been simply unhittable as of late going a remarkable 22 straight appearances without allowing a run. 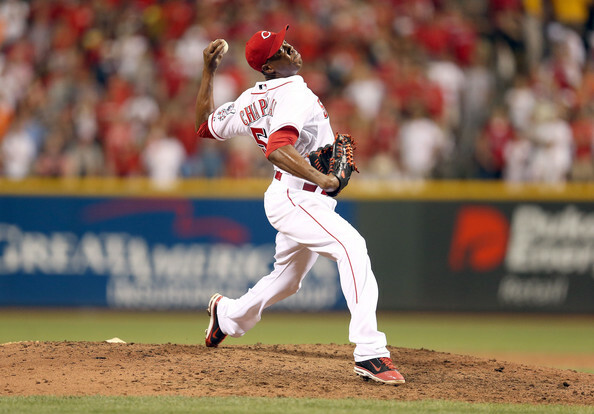 Also, in 51.2 innings against National League foes, Chapman has surrendered one earned run. Lastly he has given up just 25 hits. Really think about those statistics. Could we be on the verge of the first relief-pitcher to take home the Cy Young Award since Eric Gagne in 2003? Or perhaps the first Reds Cy Young Award winner ever? It wouldn’t surprise me. Not only are Cueto and Chapman both viable options strictly looking at numbers, but they also are playing on the team that is currently sporting the second best record in baseball. In addition, they play half of their games at Great American “Small” Park. Not exactly a pitcher’s haven. Cueto has been Mr. Consistent, never letting his ERA dip below 2.63 and going six or more innings in his last six starts in Votto’s absence. Chapman has simply been a strikeout machine posting 106 K’s in just 57 innings (1.86 K’s an inning). The kicker though is Aroldis Chapman has racked up as many strikeouts as the AL frontrunner for the Cy Young Award (Jered Weaver) in 81 fewer innings pitched. Players simply look scared and off-balance when they step in the box against the man who recorded baseball’s fastest pitch. When Chapman mixes in the slider, things just become unfair. The return of Joey Votto later this month (we hope) will excite the entire city as Cincinnati preps for their first run at a World Series since 1990. But championships are won and lost via pitching. Having two of the top Cy Young candidates on the same roster only bolsters the Reds chances come October. Chad was always a little loco. Nobody would deny that. Now he has a criminal record. I for one am extremely disappointed. I never was a huge fan of all of the infamous antics, but at least he never had run ins with the law (during his professional career). Typically, players like this end up in Oakland. Don’t count on this happening with Carson Palmer under center for the Raiders. Palmer would not be a happy camper if he and Chad reunited as teammates. Or what if Chad lands in Seattle? The “TOcho Show” Part II would be entertaining. As of now though, Ocho is a no go. Hope Solo’s chronicles of her career and life are on the way. Does this sound like a memoir of actual hope? Or just a memoir about a person named Hope? If you ask me, this will by no means be a must read, but more of a temper tantrum in print (Just ask Brandi Chastain). LA ready to take flight? With the arrival of Dwight Howard, it appears LA is poised to take flight. Kobe has a legitimate shot at #6 and the Lakers have a chance to tie the Boston Celtics with a 17th championship. It won’t be a walk in the park, but if this team gels in time for the playoffs, Los Angeles will be all smiles come June. Most importantly though, the anxiously awaited LeBron/Kobe finals matchup will finally become a reality. The latest rumor of the Honey Badger in Baton Rouge story has me a bit perplexed. Many are saying that Tyrann Mathieu is considering staying at LSU for a year as a regular student, and then returning to the football team for the 2013 season. Sure Tyrann would love to nab a national championship after coming so close this past January, but this idea sounds ludicrous to me. The Honey Badger can’t stay out of trouble as a member of the football team. Could you imagine the havoc this guy would wreak with the spare time that traditional college students have? Go the Janoris Jenkins route please. (play at McNeese State then enter the draft next April). This entry was posted in Miscellaneous and tagged Aroldis Chapman, Boston Celtics, Brandi Chastain, Brandon Phillips, Carson Palmer, Chad Johnson, Chad Ochocinco, Cincinnati Reds, Cy Young, Dwight Howard, Eric Gagne, Hope Solo, Janoris Jenkins, Jered Weaver, Joey Votto, Johnny Cueto, Jordan Zimmermann, Kobe Bryant, Lebron James, Los Angeles Lakers, LSU Tigers, Miami Dolphins, Oakland Raiders, Ryan Ludwick, Ryan Vogelsong, Seatte Seahawks, Terrell Owens, Tyrann Mathieu. Bookmark the permalink.